This is an account of Peter’s visit to Marchant Holliday School. It is a Special School in Somerset for emotionally and behaviourally disturbed boys between the ages of 6 and 13. Whilst working as a class teacher in this school I asked Peter if he would be prepared to come and talk to the boys, because like most boys of that sort of age they were mad about cricket. I did not really expect that Peter would find the time in his busy schedule, as he was by then captaining Devon. But he very quickly agreed and a date was set. Fortunately, the day in question was warm and sunny. The boys, dressed in their white T-shirts and shorts, were waiting for Peter’s arrival. Some knew who he was, others did not. But they were all his best friend when he left. Peter gave a brief talk and answered all the questions that the boys asked. Then we all, staff included, headed for our field with its bumps, tufts and pot holes. There we formally set up stumps. A very far cry from the impressive wickets of Lords or the Oval. But Peter took the game as seriously as if it had been an Ashes Test Match. As I remember all the boys had a two over innings, and everyone bowled one over, that is, six balls. They all counted, even if some of the balls failed to make it from one end of the wicket to the other. More importantly no-one was out, even if the bails were blown off the stumps by a very fierce breeze! Peter entered into the spirit of the game encouraging the boys. They all felt that they had been part of a world that they could otherwise only have seen on TV. The afternoon ended very satisfactorily with a well-deserved tea. Peter, like all of the other staff members, sat with the boys and encouraged them to talk. Before he left he had signed a huge number of autographs on anything that the boys could find. 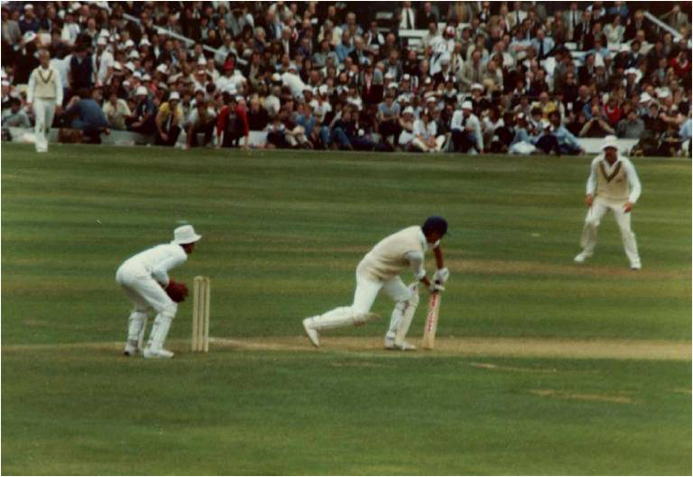 Each boy, for that afternoon, had, in his dreams, been playing on the pitch at Lords. He had fielded, bowled, batted, and some had even taken a catch. But each had made … not out! As I remember, during the whole of Peter’s visit, not one of the boys lost their self-control.